An easy and incredibly comforting squash risotto made with fresh thyme, garlic and parmesan. This risotto uses easy, seasonal produce that's perfect for Autumn/Winter. It's the perfect way to warm up on chilly nights and can be on the table in just over half an hour! Finely chop the shallot, garlic and cut the squash into 1cm sized pieces (roughly). Heat a little olive oil in a large high sided pan, once hot add the shallot and saute until translucent. Add the squash, butter and thyme and saute on a medium heat stirring often until softened (around 10 minutes). Add the garlic and saute for another minute until fragrant and softened. Add the rice and stir to coat in the other ingredients. Add a few ladles of stock until the rice is just covered, stir until the rice absorbs the liquid and add another ladle or two. Continue adding the stock, stirring and letting the rice absorb it until all the stock is used up. The rice should be cooked through, thick and creamy. Turn off the heat and add the mascarpone, parmesan and added seasoning if needed. Stir until combined and serve. Don't Rush It - I've heard many people say they are intimidated by the thought of making risotto but it's really so simple to make. The biggest tip to remember is to simmer it slowly adding the stock as needed. Risotto only takes around 30 minutes when making enough for 4-6 people. Don't be tempted to turn the heat up to cook it quickly because a lot of the flavours won't have time to develop and it won't taste great. Use The Highest Quality Stock - I always have chicken stock in my freezer but if I don't have enough I'll use high quality storebought. I like the jelly stock cubes and find that only one is enough to make this risotto. I don't tend to follow the recommended stock cubes to water ratio as it can be overly salty. Use The Best Ingredients Possible - This goes for EVERY recipe of mine. Use the highest quality ingredients possible because it makes such a difference in flavour and the end result. More is less in my opinion, I'd rather have one beautiful bowl of tasty food than two bowls of something average tasting. 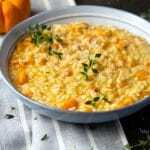 Luckily this squash risotto is a super cost effective way to feed a family and have seconds! Arancini are small deep fried balls of risotto and they are so easy to make. Simply roll the leftover rice into balls with your hands, I tend to make them golf ball sized. Get three separate bowls of flour, beaten egg and breadcrumbs and one by one dip the rice balls in the mixture in that order. Fry them in hot sunflower oil until golden brown and drain on kitchen paper.